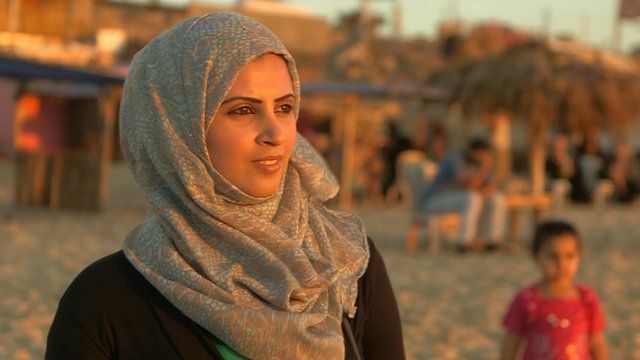 Life as a cancer nurse in Gaza Jump to media player At the age of 27, Azza Jadalla has already lived through six wars - three in the past seven years alone. She is a cancer nurse in Gaza's main hospital, Al-Shifa. Zihan Ling, 28, China Jump to media player The founder of the tech-accelerator for women talks about the challenges and importance of being a woman in the sector. Indian fight for 'right to pee' Jump to media player Mumtaz Shaikh is leading a 'right to pee' campaign in India's financial centre Mumbai to end the demand that women must pay to use public toilets. At the age of 27, Azza Jadalla has already lived through six wars - three in the past seven years alone. She is a cancer nurse in Gaza's main hospital, Al-Shifa. Every day she deals with fall-out of the on-going conflict between Israel and Gaza's ruling party, Hamas. Living in a place with a failing economy means she faces daily electricity and supply shortages at work. "Sometime we go for two or three months without pay," she says. "But this doesn't make me want to do my job any less, because it's not the patient's fault." Despite her dedication and due to shortages in Gaza, there is often only so much Ms Jadalla can do for her patients. For one patient Abdul (name has been changed), who is suffering from leukaemia, the only option for further treatment is outside Gaza.